The Element collections gather clean, isolated clips of Metal, Glass, or other materials. 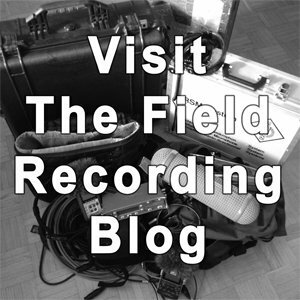 The field recordings are designed to provide a toolbox of tight, trimmed sound fx in a wide variety of elemental tones to be used as building blocks for larger sonic compositions. Coverage. The Elements series was designed to give you a wide variety of textures and tones. They gather a broad selection of props covering an abundant range of sonic characteristics. Every prop is grouped with the same sonic family, identified by type, carefully organized in folders, and labelled with matching Soundminer metadata to help find complementary clips quickly. Performance. The Elements series includes both bombastic and timid performances to cover every aspect of sonic expression. There are big takes: crashes, hits, bursts, and drops. Included with them are supporting performances: debris moves, taps and touches, tentative trickles, and more. To help find the right clip, each performance is gathered with its brothers by type, the surface it impacts, and is divided by folder and matched with Soundminer metadata. Perspective. The Elements sound fx libraries feature multi-channel recordings captured at a variety of distances. Match the distance and feel of your project’s scene with close, medium distant, and distant microphones positions. Bonus Tracks. The Elements collections provide additional sound fx created from the original field recordings. These bonus tracks twist and warp the source recordings into aggressive hits, layered crashes, heavily processed drops, and more. These extra sound design clips are meant to slide seamlessly into your soundtrack without further processing. View all Elements sound libraries. The Library Builder Bundles were created to do one thing: boost your existing sound library. While our other collections focus on one subject, these collections provide a mix of tracks. They’re sound effects we found ourselves using in our projects again and again. Options. Have you been editing for a while? There’s a good chance that you have access to a respectable collection already. So, the Library Builder Bundles are meant to augment the sound collection you already have. Why? You know what it’s like to wrestle a sole, lonesome sound clip repeated to picture. A single version of a take won’t do the trick. You need multiple takes so you can piece together the sound you hear in your mind. The Library Builder Bundles give you options. That’s why each bundle includes multiple versions, takes, and perspectives. This provides flexibility. The Library Builder Bundles fill the holes in your collection, or freshen your library with new takes to play with. Support. The Library builder bundles supply what are known as foundation sound effects. These types of clips are the backbone of your collection. They find their way into every project. Sure, you’ll cut in machine guns, lion roars, and squealing tires. But those headliners don’t work alone. The Library Builder Bundles fortify your creations with subtler, supporting clips. They fill the scenes between the battles and drama. The clips in the Library Builder Bundles are the “best supporting actors” in your soundscape. Light On The Wallet. Airborne Sound has worked to keep the price of these bundles low. Why? Well, you’ve likely spent cash on an existing collection of foundation sound effects already. Think of these bundles as an inexpensive way to give your existing library a boost. The Library Builder Bundles are designed to compliment your library with a mix of popular sound clips commonly needed in projects. View all Library Builder Bundles. 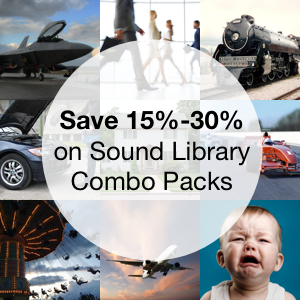 These Library Bundle collections feature sound clips of vehicles. They gather together dozens of clips from many vehicles in a single category: cars, boats, aviation, trains, and transit. They are curated to offer you a broad selection of sound effects from each category with multiple takes, perspectives, vehicle models, and more. View all Library Builder Vehicle Bundles. The Library Builder Mixed Bundles are similar to our other Library Builder collections, with one difference. As you saw above, the regular Library Builder packs provide clips that focus on a broad theme: cars, household sounds, office sounds, aviation, and more. By contrast, the Mixed Bundles offer a wider selection of clips from dozens of themes. There are two types: Variety collections, and Half & Half Sound FX Packs. The Variety collection includes a range of recordings in 150 clips. The Half & Half Sound FX Packs balance 50 atmosphere recordings with 50 shorter, specific sound effects. These libraries are good starter libraries. They provide a mix of popular sound effects for a low price. View all Library Builder Mixed Bundles. When you’re starting your first gig, you may not have that much cash. Airborne Sound’s Bargain Bundles are priced so you can download new clips without much outlay. 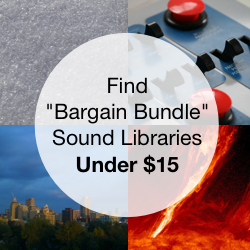 The Bargain Bundles are sound effects packages organized around a single theme. The packages have 50+ files, and are priced below $15.